This project was developed by the Higher Orbits Go for Launch! student competition Orbital ATK Division winning team, the Saguaro Snakes (Gilbert, AZ). The project is focused on establishing a baseline for plant growth in extraterrestrial colonies. Microclover, a resilient and drought-tolerant legume will be grown in microgravity to determine the effect of the space environment on the nitrogen-fixation process and micro-green growth. Insight gained from this experiment could be useful in ongoing efforts to create a self-sufficient greenhouse in microgravity, which would necessitate a soil nitrogen source for exploratory purposes. The Cost-effective High E-Frequency Satellite (CHEFSat) tests and prepares consumer communications technology for use in space. The growing range of devices, components, and miniaturized technology available in the consumer market represents a boon for space exploration and cost management. CHEFSat seeks to validate a consumer-grade radio frequency device for wider space use by testing its safety and effectiveness in a working CubeSat deployed from the ISS. The E. coli AntiMicrobial Satellite (EcAMSat) investigation seeks to determine the lowest dose of antibiotic needed to inhibit growth of Escherichia coli (E. coli), a bacterial pathogen that causes infections in humans and animals. The experiment will expose wild-type (naturally occurring in nature) and mutant strains of E. coli to three different antibiotic concentrations and then examine the viability of each group using a dye that reveals metabolic activity. As the first mission in the 6U satellite platform configuration, EcAMSat also serves to demonstrate the capabilities of this technology. EcAMSat is being developed through a partnership between NASA’s Ames Research Center with support from the NASA Space Life and Physical Sciences Research and Applications Program and the Stanford University School of Medicine. The Effects of Microgravity on the Life Cycle of Tenebrio Molitor (Tenebrio Molitor) experiment aboard the ISS investigates how the microgravity environment of space affects the mealworm life cycle. Mealworms represent good test subjects because they are well-studied organisms. An automated laboratory apparatus images mealworm growth from larval to adult life stages and then returns samples to Earth based labs for more detailed analysis. This project was conceived by the Higher Orbits AIAA Division winning team – Operation Galaxy X (Herndon, VA). The Integrated Solar Array and Reflectarray Antenna (ISARA) prepares a new hybrid antenna and power system for space applications by demonstrating its use in CubeSat-based environmental monitoring. Advances in material science and electrical engineering have made possible a flexible solar panel that can send and receive messages. ISARA tests the performance of these new solar antennas in collecting instrumental data aboard a CubeSat deployed from the ISS and monitored by ground-based engineering crews. The Life Cycle of Arabidopsis thaliana in Microgravity (Arabidopsis thaliana) project studies the morphology and physiology of a common plant species using specialized modular growth chambers aboard the ISS. The plant under investigation grows from germinated seeds under automated light, temperature and nutrient conditions. Automated cameras image growth at every stage to determine both plant viability and the effectiveness of cultivation modules, which return to Earth for further post-mission analysis. About 90 percent of global trade is shipped by sea; however, tracking of oceangoing ships is inefficient and many ships are unmonitored as they transit the world’s oceans, far from land and out of range of ground-based beacons. The NanoRacks-LEMUR-2 satellites are part of a remote sensing satellite constellation that provides global ship tracking and weather monitoring. The satellites in this investigation are deployed from both the ISS and the visiting space vehicle, demonstrating the technology at a range of altitude bands. The Aerospace Corporation, (El Segundo, CA), Siegfried Janson, Ph.D., and Richard Welle, Ph.D. The Optical Communication and Sensor Demonstration (OCSD) will test specific functions of laser-based communications using automated CubeSats deployed from the ISS. Optical communication (communication using lasers) is a next-generation technology that improves the distance, accuracy, and speed of communication in space and in space-to-ground applications. OCSD readies a compact version of this technology for space by demonstrating accurate high-speed optical communication between two small satellites working closely together in low Earth orbit. PROPCUBE-Fauna uses a CubeSat platform to collect critical data for improving communications systems. Both Earth- and space-based communications systems use the outer electrical field of the Earth’s atmosphere to transmit, bend, or bounce message signals. PROPCUBE-Fauna will perform high-resolution measurements on the exact position, density, and potential vibration of this field to transmit signals in a more effective manner. NASA Johnson Space Center (Clear Lake, TX), Sarah Wallace, Ph.D. This set of STaARS experiments will be conducted in a new facility on the ISS, the NEXUS Lab, which was designed and built by SpacePharma. Dr. Wallace will be completing a two-part experiment that began on SpaceX CRS-12 involving Staphylococcus aureus (a common skin pathogen). Her experiment examines microgravity-induced molecular alterations that cause S. aureus to change color from its normal gold to clear and that cause the bacteria to lose pathogenicity. By elucidating the mechanisms within S. aureus that change during growth in microgravity, this research could to lead to drug discovery and new therapies. This investigation also serves as a validation study for the NEXUS lab, which seeks to provide researchers with another reliable option for life science research on the ISS. The National Geographic Channel–Virtual Reality Educational Video for Television Series “One Strange Rock” will transport a virtual reality camera to the ISS to record a National Geographic special on the Earth as a natural life-support system. Crew onboard the ISS will record a series of virtual reality pieces for incorporation into a larger documentary about the natural history of the Earth and the solar system. Each episode features a different crew member and uses next-generation virtual reality technology to address different topics related to our planet and the space program. This launch manifest adds to an impressive list of experiments from previous missions in 2017 including research in the areas of stem cells, cell culturing, protein crystal growth, external platform payloads, Earth observation, and remote sensing as well as student experiments. To learn more about these investigations and other space station research, visit www.spacestationresearch.com. 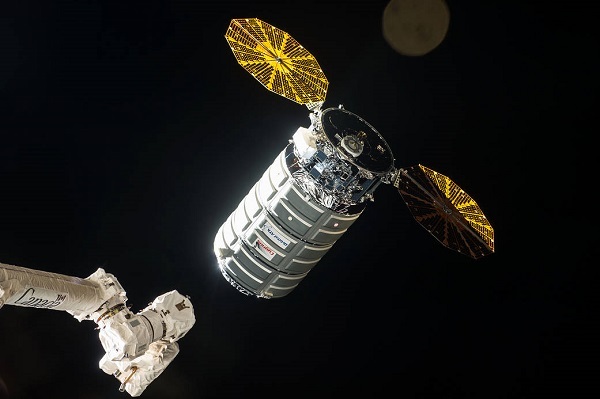 The last two or three Cygnus missions have acted as microgravity research platforms for short intervals between release from ISS and destructive re-entry. An apparatus to investigate fire propagation in zero-G has been activated once they’re well clear of ISS. I agree that it would be good if Orbital could get customers for a Cygnus-based version of SpaceX’s seemingly abandoned DragonLab idea. One potentially large problem, though, is that Cygnus lacks the ability to return any downmass. That would seem to radically limit its utility as an experiment platform. Perhaps there are other dangerous experiments besides fire propagation that Cygnus could also host on a short-term basis before re-entering and burning up.